Joseph Rodriguez’s New York accent is thick, very thick. 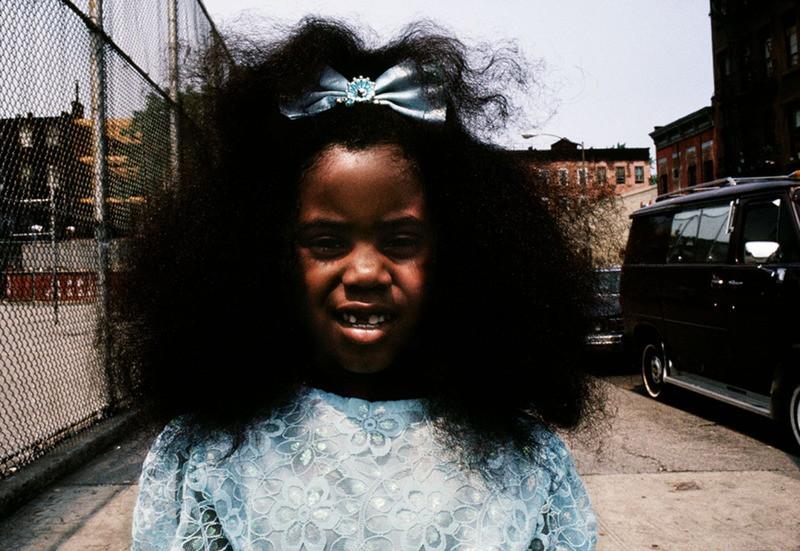 However, the Brooklyn born photographer is a citizen of the world, and his work speaks to that fact. 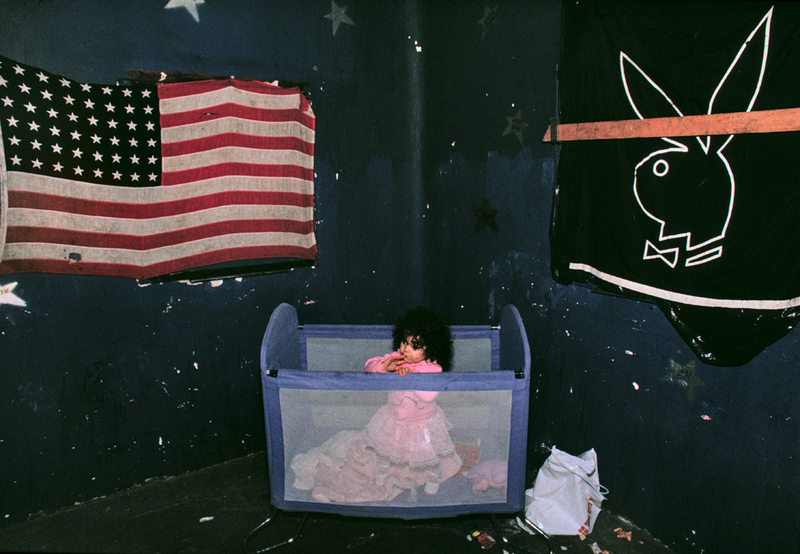 He started taking pictures, in earnest, in the mid 1980’s and has produced several books of documentary photography. Each on different subjects, but always adhering to a specific message: learn from this. He has worked on several multimedia projects as well, an ongoing project, ‘re-entry’ which looks at the lives of people coming out of the criminal justice system, and most recently a piece on the BBC about Arab youth living in Sweden. I was lucky enough to be able to interview Rodriguez about his work and his life. 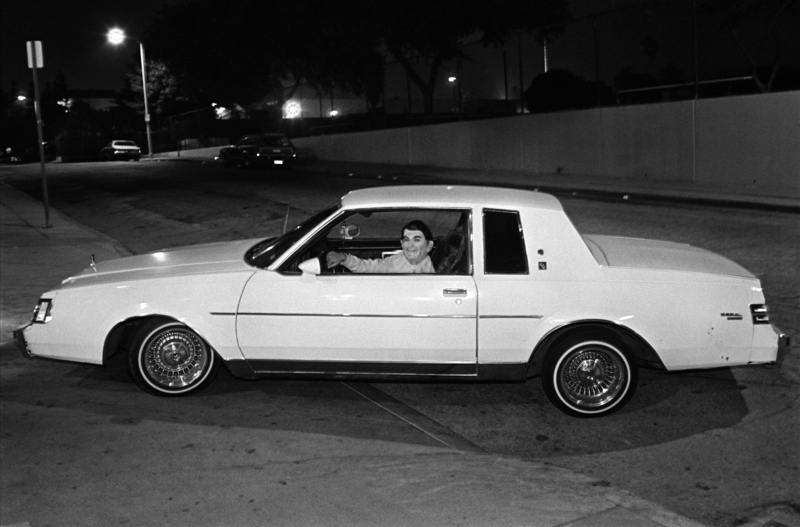 AA: How did you get into documentary photography? JR: Photography came in different waves to me. I’ve always had a mind that was visual, because I used to daydream a lot. I spent a lot of time as a kid at the cinema, and watching old movies on television so, I would say it started around then, when I was 6 or 7. But, I never picked up a camera until I was 20, when I came out of Rikers Island for the first time. I moved away from where I was living in South Brooklyn, to another part of Brooklyn, so I could get myself together. I was on the streets, I was using drugs and that preoccupied my whole life. Photography became a way for me to change my life. I didn’t have money to go to school but in the magazine Popular Photography there was this school, a photography mail order kit. I don’t think they even exist anymore. I sent away for it and I learned from that how to develop my own film, my own E6 slide film, I built my own darkroom, I built a little studio all in my apartment. I photographed my family, my neighborhood a little bit. But, I was afraid of people. I used to have a 135mm lens, that’s what I used, that’s how close I got. Then I got mugged and lost the cameras and didn’t touch photography seriously for a while. A lot of things changed. I went to CUNY, New York City Community College, in downtown Brooklyn, where I studied graphic arts technology. When I got out and I started working downtown for a lot of engravers. We would do color separations and press proofs. We worked on the first hell scanner that came by in an art printing shop, so visually, technically, I was real sharp but I was miserable. 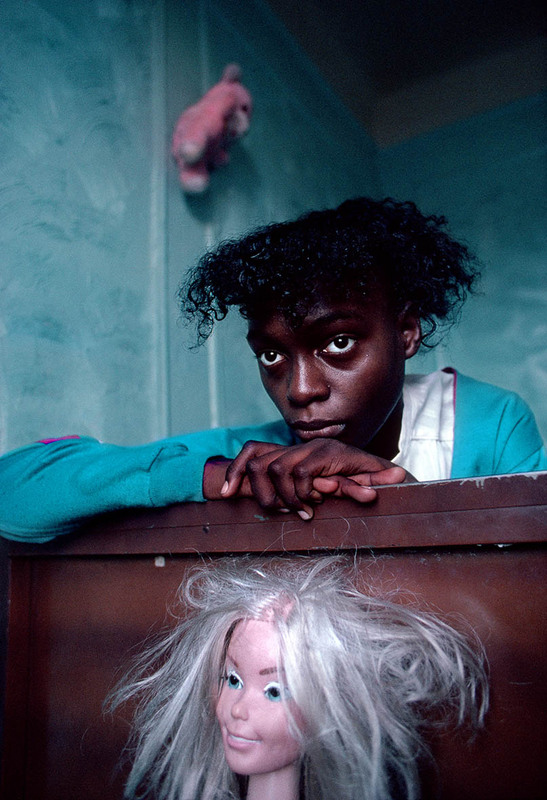 I took a photography class at ICP, called “color on the street” taught by Robert Blake. He taught me how to open up my vision, how to see something else. I started getting into it again. After that I went back to ICP, started working in the darkrooms and just worked and worked and worked. They gave me a scholarship in 85 and that was the start. AA: What was your first major project? JR: Spanish Harlem. Because it was close to me. My uncle had a candy store up there and I used to go up there all the time. I knew the music, I knew the place, and I knew that world. 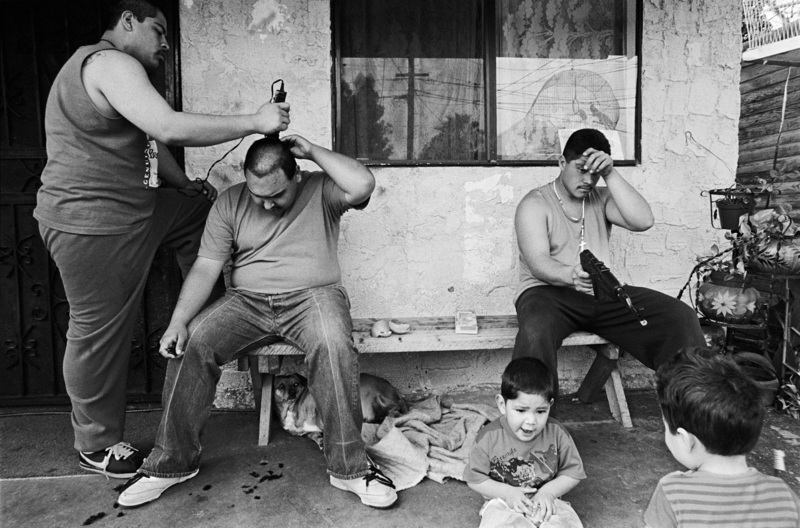 A lot of your work focuses on specific subjects of the urban ethnic underclass and opening their stories up to those who care to look. Why these subjects? It comes out of desperation. I was just talking to my friend, the author Ruben Martinez, about this. When you are young and you are the ‘other’, and you don’t fit in to society in the way you think you are supposed to, you become hungry, you create something. That’s where Hip Hop came from. You know, back in the early 80’s Ralph Lauren and Calvin Klein and all those big designers used to send in their people to our neighborhoods, where we played basketball, to check out what we were wearing. Man, we used buy ten dollar khaki pants and cheap sneakers and then they would turn around and model their new lines off of us. So we grew up with that way of seeing how our society works, and always feeling like we were on the outside. So, instead of being rebellious, I took my camera and turned the negative I saw into a positive. The act of photography became a way to be seen. To be quite honest, I needed to know that I existed and then with that, I embraced the notion that we all need to be seen. 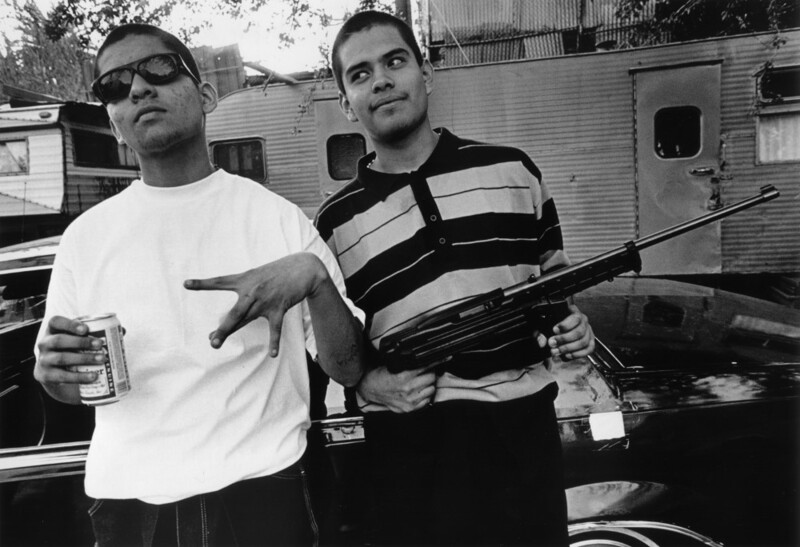 AA: How did the East Side Stories series come about? JR: When you grow up in the streets of NY you grow up hard, it gives you the background to understand that lifestyle. That lifestyle I understood, the drug game I knew very well. When I went out to the streets of LA I didn’t go out there a news reporter. My work is very subjective, I don’t believe in that objective stuff. To get to those pictures that you’re familiar with now, it was a hell of a lot of work. When I flew to LA I didn’t know anybody, I didn’t have any connections. I had this romantic notion; I thought I was going into this West Side Story kind of deal, because the gangs in New York were very different that they were on the West Coast. 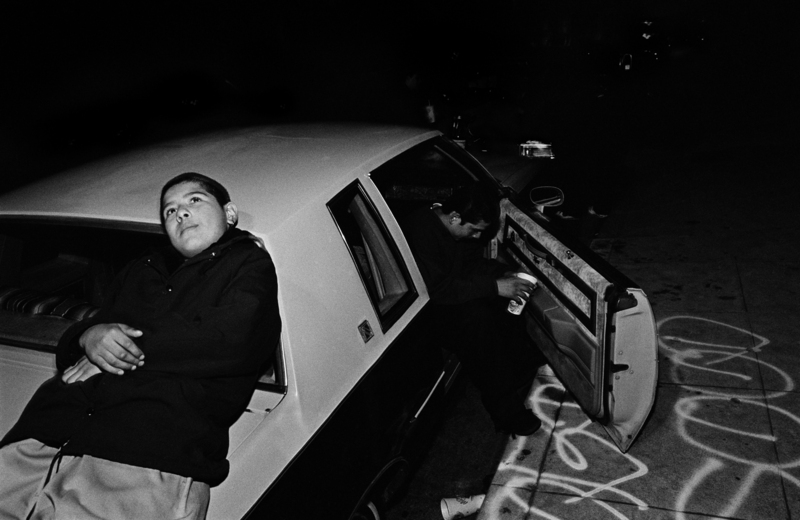 I thought I was just going to find some girls, and smoke some mota and drink some beer and just kick back…the way Bruce Davidson did his Brooklyn gang story. But it was very different. The minute I got off the plane I realized this is something different. It was just after the Rodney King riots, you see all this debris everywhere and things were tense. To get to the Florencia 13 guys and anybody else it was a lot of talking, walking and listening before the camera even came out. Your work from both your Spanish Harlem and East Side Stories series are included in a show right now at the 601 Artspace. 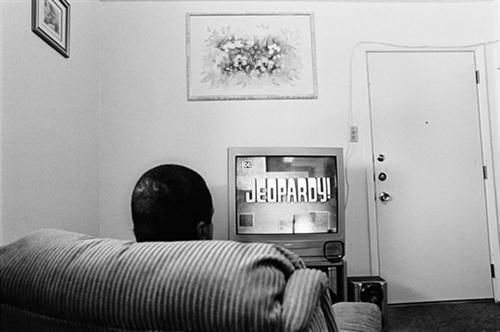 The show deals with presentation or re-presentation of subjects in documentary photography. 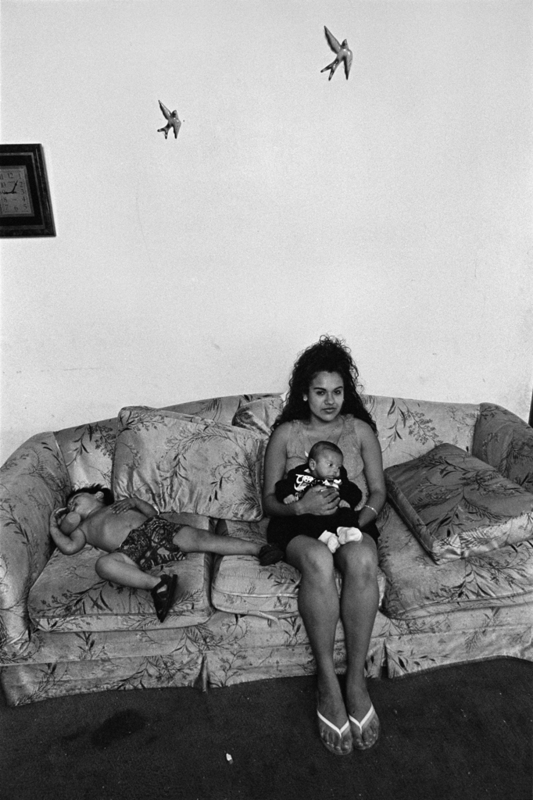 You mentioned Bruce Davidson, who also photographed the community of Spanish Harlem in his book ‘East 100th St.’, how do his methods, photography style and re-presentation of subjects differ than yours? Was his work in your mind when you were making your pictures? JR: Always. We always live in the shadows of what shadows come before us. I tried to go about it in a way that was culturally different than his approach. He was an outsider who became an insider, after two, three and four years of working on East 100th St. everybody knew him and embraced him. I know Bruce and he has some interesting things to say about my work and I honor his vision and him as a photographer and a photojournalist. I think he has put down some very important historical work. However, with the camera he chose to use, he shot mostly portraits. I wanted to get beyond just a portrait. I wanted to show the life of a place, so I slowed it down a bit. I hung out on just one block on 117th St. and hung out with the Rodriguez family, the Wilson family and a couple other families and just slowly moved with them. Bruce Davidson shot his photos in black and white. I started my series in black and white and then changed to color because I knew how important color was to the culture—the colors they paint in the house, the colors on the saints that they have, the colors of the clothes. So I made that conscious decision to switch and also, I needed to work. I was a young photographer and I realized I couldn’t get work just shooting in black and white. I’m half Puerto Rican and half Venezuelan. Bruce isn’t. 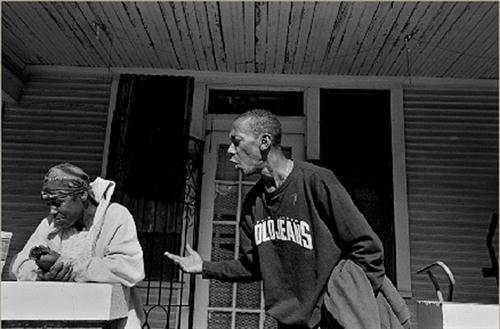 When I was exposed to his work I was like, Wow, but there were nuances in that neighborhood that I just knew. He picked up on them after a while. I like to work very slowly. There are guys who are rabbits and there are guys who are turtles, I’m a turtle. With the documentary process I like to allow myself the chance to make mistakes, to allow myself the opportunity to go back and re-visit. With the option of having more time you get a different story a richer story. 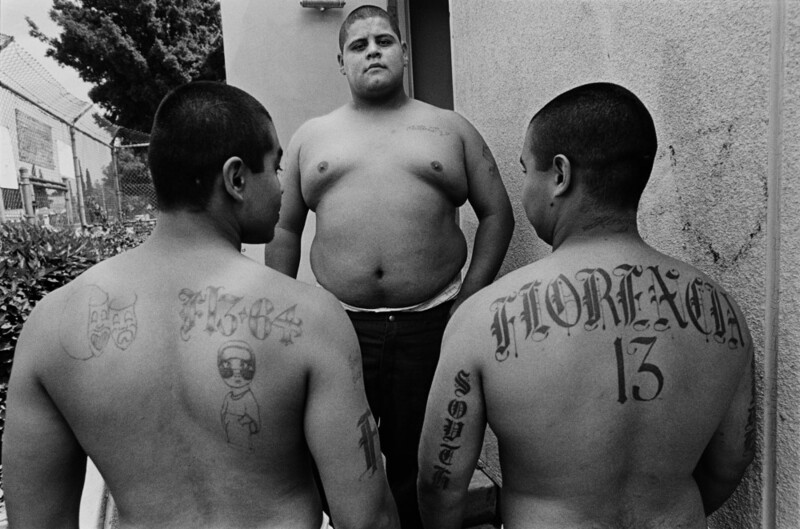 AA: You had to become an ‘insider’ in LA with the LA gangs for East Side Stories. What are some of the things you wait for to happen as a photographer in order to really be able to inform your work and to tell the story you’re seeing? JR: In more than one instance there was a testing ground. 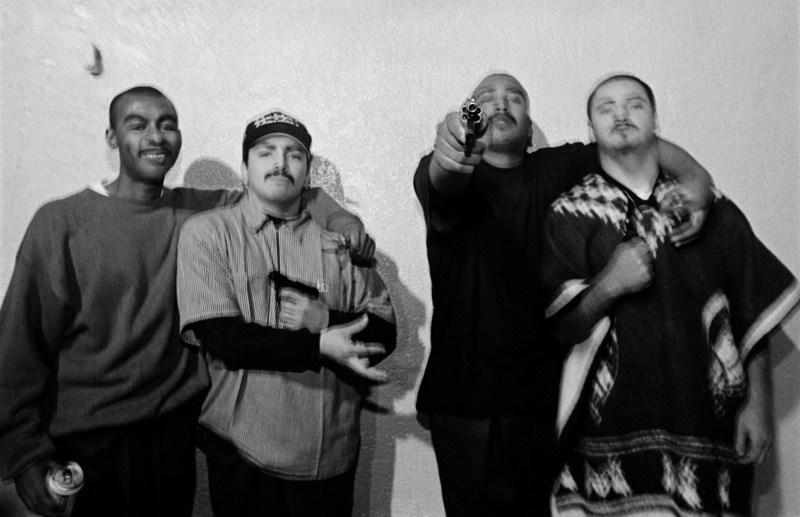 One night with Evergreen (gang) after the meetings to get the OK for me to hang with them, I took the photo with the four guys and one, Scoob-Dog, is pointing a gun straight at me. After I took that picture, it was amazing what happened, they said this guy’s crazy, they wanted to jump me in, they wanted to give me a name, it was either ‘Fuji’ or ‘Kodak’…I picked ‘Kodak’. It was pretty amazing. But, you know, as a photographer you’re always an outsider, otherwise you can’t step back and document the scene. It was about sharing. 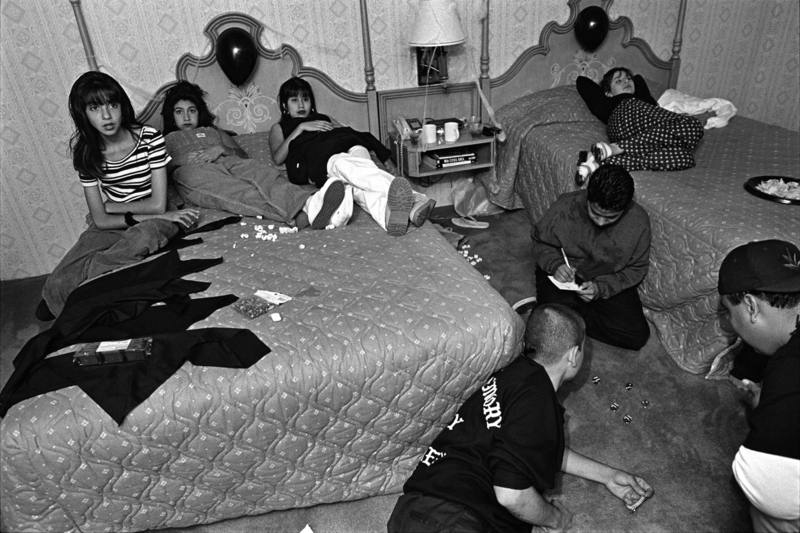 I had gone to a lot of quinceaneras, I had been to the hospitals with these guys. I started to realize that this story was going to be something important. Why did I know that? Because these kids told me. They said, “Man these LA Times journalists parachute in and then they’re out. They don’t get the story.” There’s one photo in particular, the one of the guys throwing a bottle at some rivals on a school bus that stands out. That day I had gotten an assignment to go to Bosnia to shoot what was going on there. That kid, the one throwing the bottle, told me, “Why you gonna go to Bosnia? There’s one right here.” I stayed, and that’s what made me stay. AA: What are you trying to inform the public about with your photos? JR: I’m not trying to inform the public, I’m trying to inform our kids. 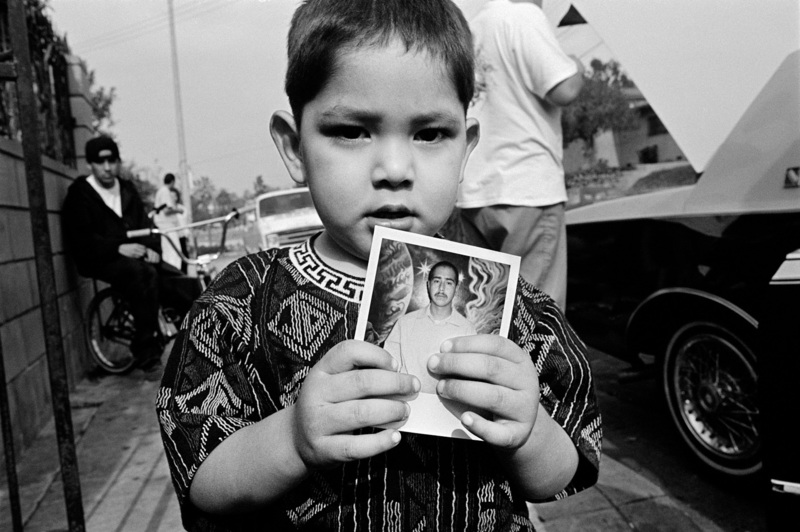 In our world, these kids, where there is a struggle that’s going on, it’s important for their community to know that their histories are being put down. Because the ‘gringos’ always get it wrong. That’s the reason I do the work I do. I just got an E-mail from the juvenile justice dept. in San Jose, California telling me that they’ve been using my book ‘Juvenile’ ( Powerhouse, 2004) as a teaching tool to their new counselor recruits and for the parents of kids being introduced to the system. If it’s going to help open minds and help some people, Man, I’m all about that. ‘Juvenile’ is a personal book, very personal. You open to the first page, what do you see? Joseph Rodriguez’s mug shot! It’s a story I’ve held onto for 30 years. I remember what it was like going through Rikers Island, there was no love the way there is today, there were no counselors to help you along. I sat in a cell. There was none of this: ‘let’s take care of these little kids’. It was hard-core, serious, bigtime! Man, I almost committed suicide, and I was kicking heroin at the same time, man, it was rough. These stories are stories that have been in my head for a long time. ‘Re-entry’ was the same thing, it’s a story about our parents, cause all the men in our families were getting locked up. You know, at first, I was thinking why aren’t they really looking at us? In terms of being Latino in America. I mean, you like our rum, you like our tequila, you like our women and our cars and all that. It just seemed like all the big media guys seem to get it wrong, they try to get it right but they just don’t. For example, when we were doing ‘Migrantes’, that I am working on with Ruben Martinez, we were in a small, tiny Purepacha Indian village, and we are following this family that is getting ready to cross over [to the USA] and they’re going to the local ‘curandera’ or healer, and go for a cleansing and go get their cards read. You show this series to an American editor, they go “Oh yeah! I get it. He’s getting his fortune told.” No, they don’t get it. They’re missing the whole social, cultural part of it. That’s where my job comes in. To set it straight. AA: You teach an Advanced Documentary Studies class at NYU. How do you teach this craft and what do you see from your students? It’s mainly based on still photography, but it includes a lot of multimedia. 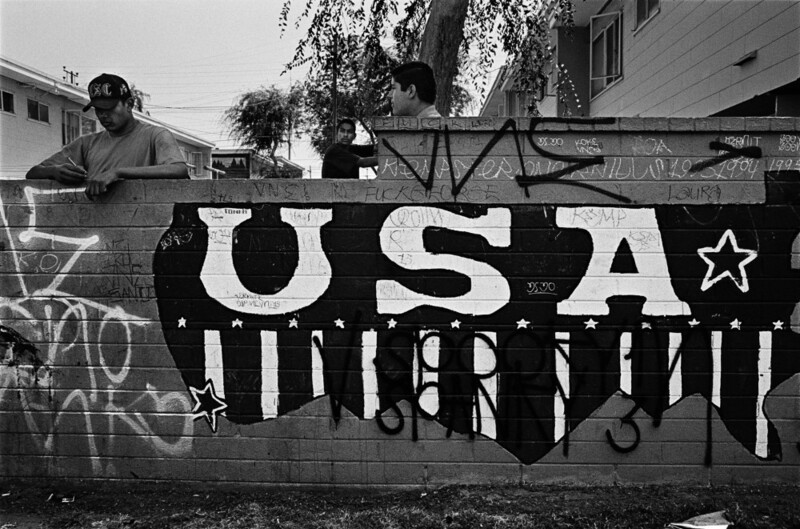 I show them Martín Chambi , Anders Peteresen, Mario Giacomelli, Rodchenko… we try and get outside the normal European-American box, so to speak. It’s important for me to instill a greater visual vocabulary in these kids, even though they think they know everything already. With digital media it’s easy to go out and take a great picture, and photoshop it and make it look beautiful. But, if you look at the photographers that came before us, not every photograph was tack-sharp, not every picture was that emblematic shot. If you’re working in the essay form a weaker shot might make the next image stronger. It’s a way of thinking. So one thing I tell my students is how to listen, and slow down. And the other thing is working through guilt. Because a lot of students feel like they can’t or shouldn’t be taking pictures in a community outside their own. Is this important enough a thing for me to do to be in an uncomfortable position for, or maybe in a dangerous position? It’s extremely important to be honest with yourself. 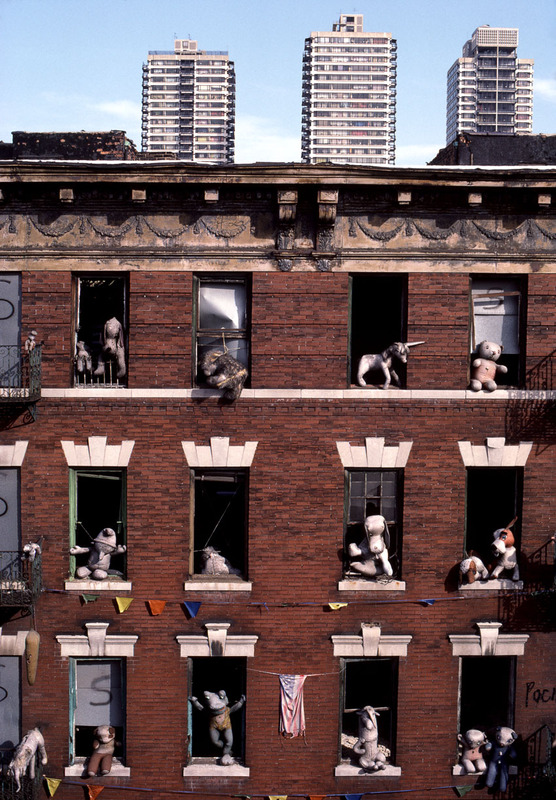 Right now, I’m trying to get the film ‘On The Bowery’, for class. The film was done in the 50’s. 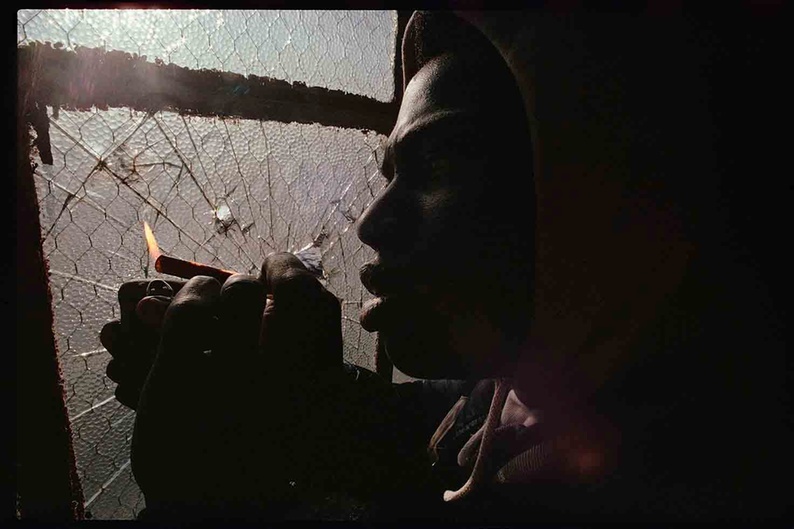 The filmmaker [director Lionel Rogosin] went out on the Bowery to make a documentary about the guys who were on hard times there. These were guys who had come home from WWII and were living in the flophouses and drinking and laying out on the street. This guy spent six months getting to know these guys. Six months at every little bar every little hotel, before he even took out a camera! Everyone wants this intimacy, but you can’t just come in and out, like a bumble-bee, to get these intimate moments. You always have to be aware. Yes, Bresson said you have to be as quiet as a lamb and as quick as a fox, so when you see that image, you take it. You fight for it. But you have to sacrifice time. If you want to be a documentary photographer these days you better take your hat in your hand, pull up your pants cause you’re going to be more like a beat poet from the 50’s and 60’s. You’re a rebel, there’s no support system for you really. You know? You’re going to take a lot of rejection. 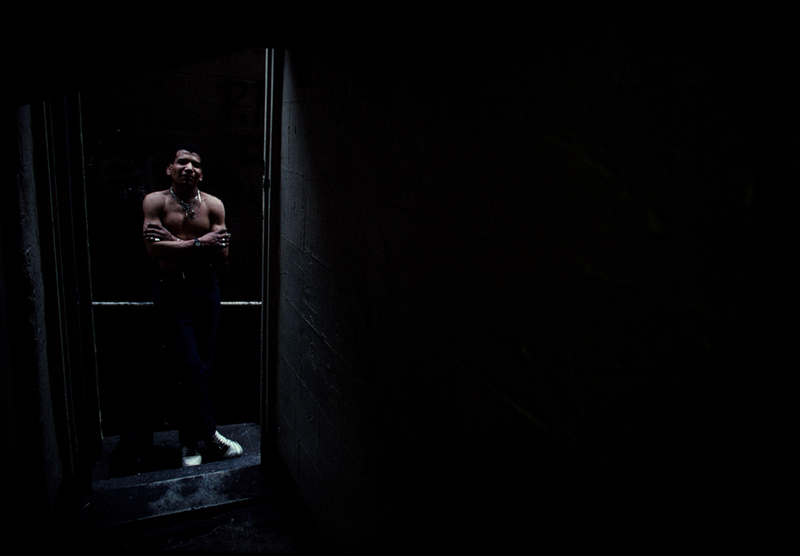 Rodriguez’s work from two of his earlier works, Spanish Harlem (D.A.P./National Museum of American Art, 1994) and East Side Stories (Powerhouse, 1998), are currently featured, along with work by the photographer Martín Weber, in a show at the 601 Artspace in Manhattan. The Show, Culture Memory Matters, deals with the presentation of culture and individuals in a globalizing world. 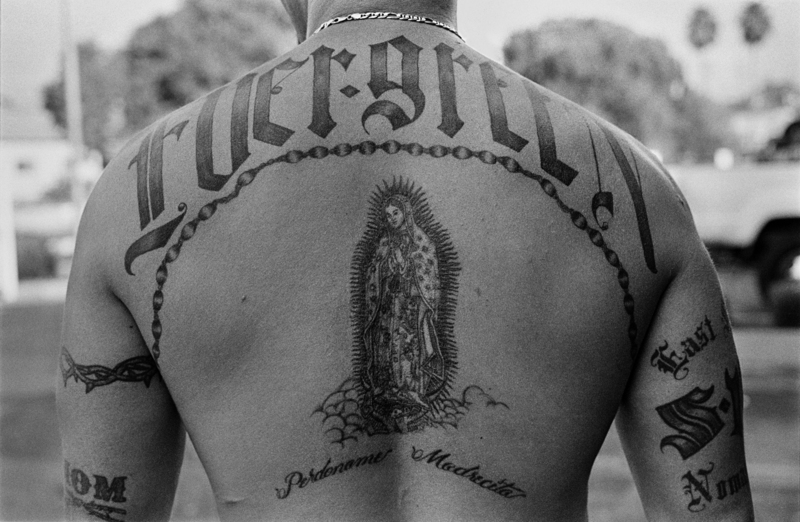 Posted in Documentary, Interviews and tagged Archive Highlights, Interview, Joseph Rodriguez, Los Angeles, New York City, Street Photography.